Kiriwina Island (151.05E 8.5S) is the largest of the Tobriand Islands north of the eastern tip of New Guinea. Kiriwina is shaped a little like a tadpole, with a round upper part and a long peninsula to the south. It is about 25 miles (40 km) long and seven miles (11 km) across its head. It is very flat, with a maximum elevation of 180' (55 meters) near its north end, and it and covered with jungle. Its population was about 7500 persons. The island had numerous trails and its flat terrain was suitable for airfields. However, it lacked suitable landing beaches. The RAAF had set up a radar station on the island by March 1943, and the radar crews were alarmed to see Japanese survivors of the Battle of the Bismarck Sea coming ashore on 7 March. The next day, Australian troops killed 34 survivors and captured three, with eight other escaping into the jungle. 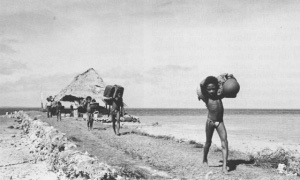 Survivors continued to come ashore for some time thereafter, whom the pro-Allied natives turned over to the Australians. The Kiriwina natives allegedly later held a celebration with dances and songs reenacting the slaughter of the Japanese (McAulay 1991). Elements of 158 Regiment and 59 Combat Engineer Company arrived on 24 June 1944 to build a coral causeway on the north coast. The landings took place at night without air cover and were hindered by the reef and lack of good landing sites, and the ships were forced to withdraw at dawn with much of their equipment still aboard. The remainder of 158 Regiment landed on 30 June and, despite heavy rain that hindered construction, a 5000' (8050 meter) runway was ready by the end of July (151.089E 8.431S). This was later extended to 6000' (1830 meters).